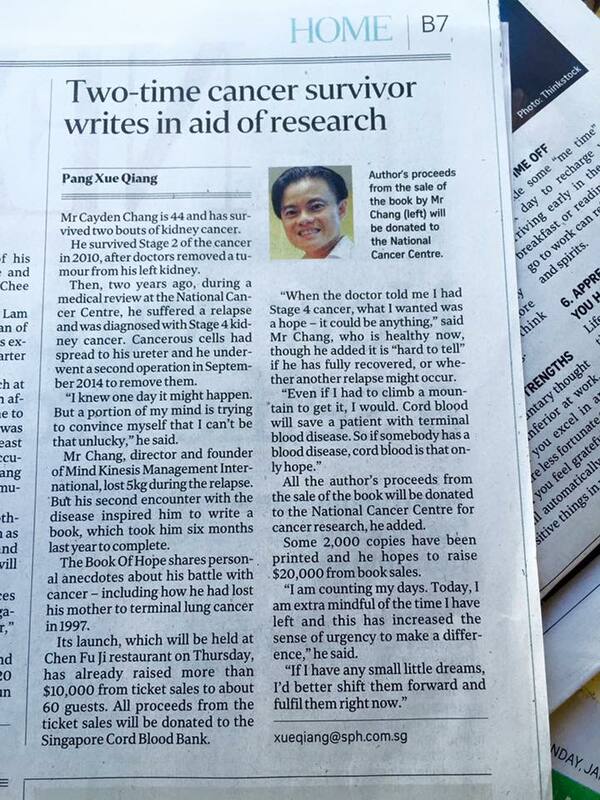 Two months ago, I was inspired by the article of Cayden Chang in the mainstream newspaper, he is a two-time cancer survivor, entrepreneur, author and founder of Mind Kinesis Value Investing Academy. Today, I am honored to have him coming on board to be part of my mini Interview Series. A1 : I am the Founder of Mind Kinesis Value Investing Academy, which focuses on running Value Investing Programme, the first and only value investing training that is recommended and endorsed by Mary Buffett, the internationally acclaimed author and speaker of how billionaire Warren Buffett invests. 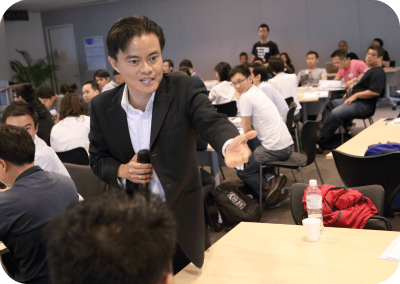 My company also runs Value Investing Programme and other investment related workshops in Singapore, Malaysia, Vietnam, Thailand and Cambodia. I am fortunate to be trained in value investing by Professor Bruce Greenwald in Columbia University, the institution where Billionaire investor Warren Buffett met Professor Benjamin Graham, as well as by Professor George Athanassakos, the finance professor who holds the Ben Graham Chair in Value Investing at the Richard Ivey School of Business, University of Western Ontario. Even though my education in National University of Singapore was in Science, I realised that with some effort, anyone with absolutely financial background can learn how to invest. As a two-time cancer survivor, my biggest dream is to build an endowment fund to support cancer research and palliative care, which is why I am passionate about investing. 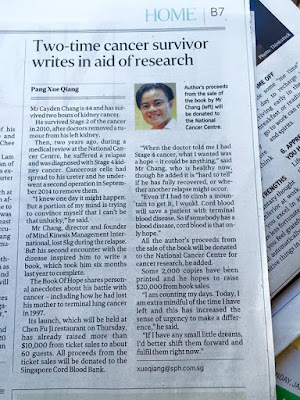 My 2nd book titled “The Book of Hope: One Man’s Journey Facing Cancer As A Young Husband, Father And Entrepreneur” is currently selling at all Kinokuniya book stores, and all my proceeds go to cancer research at National Cancer Centre. A2 : I run my companies and invest at the same time. A3 : I started investing in my 20s thinking that I was investing. It took me a few years to realise that I was not investing but speculating when I lost all my savings of US$50K+ during year 2001’s bursting of the dot-com bubble. It was then after this crisis that I truly learnt the meaning of investing. This is an important lesson that everyone needs to know. An investing attitude is to look at the assets that produce the returns and then buy it at an undervalue price. On the other hand, a speculative attitude is to treat any stock like a number and hope that it goes up in the short term. (a) A – Assess. In this step, I attempt to assess the business both qualitatively and quantitatively. Qualitative includes understanding the business model, how the management is running the business, does the business have a durable competitive advantage, etc. To support our qualitative judgement, we need to look at the quantitative factors such as the trend of their earnings, cashflow, margins, debt, etc. (b) A – Acquire. Once we assess that it’s a business that we want to acquire, then the next step is to valuate the business. There are many ways to valuate businesses but the philosophy is to do an intelligent estimate how much the business is worth per share including a buffer for error (ie. Margin of safety). (c) A – Asset Portfolio. Once you have intention to acquire a business, the next question is how much? Assuming that we know, when do we sell to have a portfolio that consistently pays us? A7 : Our website at www.investment-in-stocks.com. Another two websites I like is www.valuewalk.com and www.oldschoolvalue.com. A8 : I used to co-owned three US properties and I have sold all. As of now, all my investments are in stocks and in my own education (I read a lot and I take courses regularly which is why I was been awarded the Lifelong Learners Award in 2008 by our current Minister for Health, Mr Gan Kim Yong). A9 : About 50% in cash, and 50% equities (consisting both US and Singapore). My 50% cash is to standby for another crisis in which foresee may be coming soon. Q10 : If the readers want to get in touch with you, how to get hold of you? A10 : Do register for our Free Masterclass www.valueinvestingprogram.com and anyone can contact us at enquiries@mindkinesis.com and 64387010. We are more than happy to answer any queries.